Back in April Ukrainian Intelligence passed photographs to the Organization for Security and Co-operation in Europe (OSCE) which, they claimed proved that Russian Special Forces were operating in Ukraine to destabilize the country. The photographs depict the gunman operating in the east of the country, where they had been seizing government buildings. The photos appear to show that the same group has been part of the take-overs in Slovyansk, Kramatorsk and Crimea. The documents also claim that one bearded gunman photographed in eastern Ukraine is a Russian Special Forces soldier who was also photographed in Georgia in 2008. Thus proving a connection with the Russian Government. The link to Russia rests on the photographs of the bearded gunman. However other photos of the man cast doubt on whether he and the Russian soldier in Georgia are in fact the same person at all. In Georgia the man’s beard is reddish-brown, yet the man in eastern Ukraine has a grey beard of a different shape and different facial features. Russian social media however has been considerably more successful at establishing the identity of the pro-Russian gunman. Using the Russian social media website Vkontakte the public profiles of many of the gunman photographed in eastern Ukraine can be found. The profiles raise many questions about the allegiance and ideology of the men. The most prominent members of the militia appear to be part of a mysterious and ideologically questionable unit known as the Terek Wolf Sotnia. The profiles of the men show a recognisable V shaped insignia of a black, green and red tricolour, with the head of a wolf in front. The emblem and name of the unit are based on a WW2 Russian Cossack military unit which fought alongside the Nazi’s led by a man named Andrei Shkuro. The profiles are the most revealing about the identity of the men. Many of the men do appear to be Russian citizens, but others too claim to be natives of Crimea or Eastern Ukraine. What’s most worrying is that a significant number of the men appear to harbour Fascist and ultra-nationalist sympathies. The pro-Russian rebels often claim to be defending Eastern Ukraine from Fascists operating in the Ukrainian Army. If it were the case that fascists were also operating in the pro-Russian forces this would undermine this claim. One of the men photographed in Ukraine appears to be Evgeny Ponomarev who, according to his Vkontakte profile is from Belorechensk, Russia. Ponomarev is an active member of the Cossack Community there and appears in this photograph to be a member of the local Cossack police force. His profile also contains a picture of the emblem of the Terek Wolf Sotnia. Ponomarev allegedly pictured in Ukraine (L) and in two photos taken from his Vkontakte profile. Another man, seen in Crimea and in pictures taken alongside gunman seen in Eastern Ukraine appears to be Igor Georgievsky. Georgievsky’s profile claims his home town is Simferopol. A photo on his profile shows him wearing the insignia of the Terek Wolf Sotnia standing outside the Crimean Naval base depicted in this Vice report. Other photos appear to show him posing with the bearded gunman and Ponomarev. Igor Georgievsky outside Crimean Naval base and in a separate picture posing with Ponomarev and the unidentified bearded gunman. Another man photographed in Ukraine, heavily armed and in military uniform was originally identified by Ukranian Policy, a Ukrainian website and magazine, as Edvard Pitersky. However the Pitersky name and profile appears to be a fake to disguise his political beliefs. Instead Pitersky appears to also go by the name Edvard Matishin. Matishin appears, according to his Vkontakte profile, as a fascist and Nazi sympathiser. His profile is littered with racist and violent images, Nazi symbols, and images of him performing Nazi salutes. His current city is listed as Kharkiv. Yet a majority of his pictures are taken in Belgorod, a Russian city near the border of Ukraine and in Kamchatka Russia, suggesting he was at one point a resident there. In one image he is pictured in military fatigues with Vladimir Ilyukhin, the Russian Governor of Kamchatka Krai. 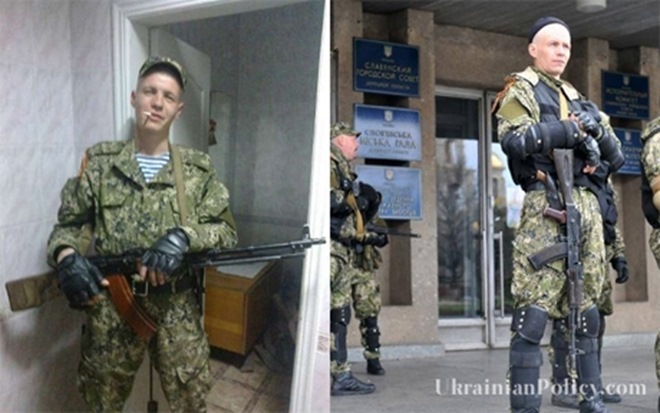 Edvard Pitersky in Eastern Ukraine (L) and two photos of Edvard Matishin from his Vkontakte profile. Another of the gunman identified by Ukranian Policy is Dima Kharkovsky. In his now deleted profile he is pictured armed with an assault rifle and RPG in front of the flag of the “Donbass People’s Militia”. Kharkovsky also appears to be a pseudonym. His real name according to another profile is Dima Shelest who is pictured performing a Nazi salute in one instance. “Dima Kharkovsky” in front of the flag of the Donbass People’s Militia and Dima Shelest. Also identified by Ukrainian Policy is Evgen Zloy. Pictured here outside the council officers in Slovyansk. Apparently a resident of Simferopol, Crimea, Zloy is also pictured wearing a medal of the pro-Russian government of Crimea. Zloy’s Vkontakte page also contains a picture of a Nazi pendant as well as pictures that appear to show him with Ponomarev, the unidentified bearded gunman and wearing the insignia of the Terek Wolf Sotnia. Another member of the militia could be Alexander Ganichev. On his Vkontakte profile it states he went to school in Donetsk, suggesting he’s Ukrainian rather than Russian. He is pictured with other gunmen in what are presumed to be occupied buildings in Eastern Ukraine. Photographs of Alexander Ganichev taken from his Vkontakte profile with other gunmen. The willingness of the pro-Russian militia to pose for photographs and to publish photos of their actions on social media also raises questions about their professionalism as soldiers. Whereas the Russian troops in Crimea wore balaclava at all times, these men have been regularly photographed showing their faces and have uploaded these imagines on to social media sites. This does suggest that the men are not professional soldiers who would be cautious about revealing information of their movements. However, the truth could be even more worrying. The prospect of an armed, militant and emboldened group of men with neo-Nazi sympathies running riot in Eastern Ukraine is very worrying, especially considering reports of attacks on the Romani population of Slovyansk and of men handing out anti-Semitic leaflets in Donetsk. It would also raise questions for the Russian government considering their stance towards the Ukrainian fascists in Euromaidan and would make a mockery of claims that the rebellion in Eastern Ukraine is about defending people against Nazis. So what if these are new-nazi that is fighting in Ukraine. Russia did not send them. Even in America, the Authorities have problems with this neo nazi groups. If the membership for neo nazi are in the range of several hundred thousand. The gov’t is not liable for what they did. If evidences point to the e Terek Wolf Sotnia, Then the Ukraine gov’t should go and arrest them. Don’t go crying to the media about it ! Yes, according to his VKontakte page his nickname was “Dingo”. bearded gunman in Georgia is red bearded caucasian. but gunman in Ukraine is grey bearded kozak. there is very little point in creating an article which just copies and pastes claims from pro Kiev propaganda sites. That’s not what bellingcat is supposed to be about. Fortunately, these people do not have anything to do with Terek Wolf sotnia. These people are former soviet folks, that have no any close connection with great Terek cossaks, whic fought against perhaps these idiots great dads, from the fall of Russian Empire to the time of second world war (on the side of Hitler’s Germany- that is how bad cossaks hated soviets). But sme people remember history, still. Geez and I thought the nazis fought on the Ukie side against the patriot partisans. How do you know these are not members of some Pravy Sektor spring-off? And how are you sure the shared (army dump) emblem indicates they fight within the same battle group?